Proudly serving all of Suffolk and Nassau County Long Island with the areas premier water and fire damage restoration teams. We are on call 24 hours a day, 7 days a week to respond to any and all property damage disaster. No job is too big or too small for our experienced restoration crews. From sewer backups in your basement, to smoke damage at your commercial offices, we can be on location with the right manpower to tackle any job! Have you recently undergone fire, water, storm or mold damage to your property? If so, then you are more than likely looking for a reputable restoration firm to help you get your home back to pre-loss condition. Look no further! The restoration professionals at Enviral Restoration Pros of Long Island are trained, certified, and insured. Whether your home has sustained fire damage, or even a nasty flood, we are fully equipped with the industry’s latest equipment to help you in your time of need. We know that disasters can happen at any time – day or night – that is why we are available 24 hours a day, 7 days a week, and 365 days a year for your convenience. We work around the clock to ensure that nothing is missed, and that you are completely comfortable throughout this whole process. Our company strives itself on providing the best of the best when it comes to service in the restoration industry – we will treat your home as if it was our own! New York Cleanup Pros of Long Island is completely licensed, bonded and insured. All of our technicians have gone through extensive training so that they are up-to-date on the latest innovations in the restoration industry and can provide you with the best level of service and care. We are a company that can tackle any size disaster. Whether your home has been ravaged by a flood or even your business charred from a small fire, we are here and fully equipped with the latest technology in drying and de-odorizing. 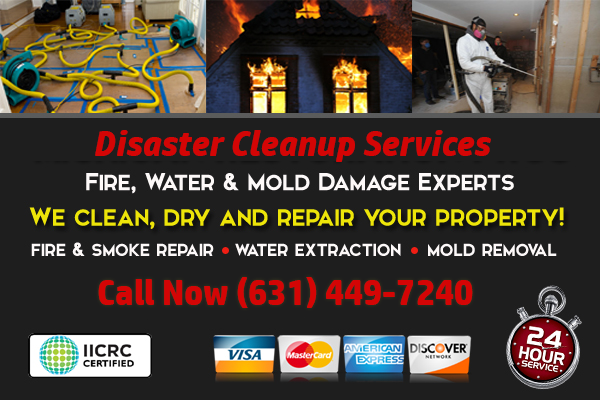 We offer a broad spectrum of services, such as fire damage restoration, water damage cleanup, flood cleanup, mold remediation and storm damage cleanup. You can count on the team at NY Cleanup Pros to get your home back to pre-loss condition in no time. It is of the utmost importance to call a reputable restoration company after discovering any initial damage to your property, or after any kind of damaging event occurs. Even though it may not look as though much damage was done, there are many things that can happen under the surface that can adversely impact the structure of your home. Since we work around the clock, we are available for you to call any time. We will dispatch a team of trained professionals to your home to not only assess the situation, but give you a run-down of what exactly you will need to do in pertaining to insurance. We can help you file a claim and will also help with dealing with the insurance agent.